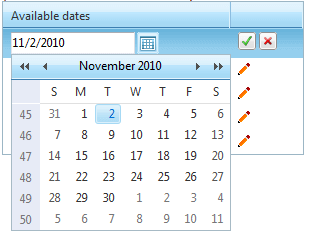 Binding a RadDateTimePicker control to a data source is easy provided you use the DbSelectedDate property. It works almost like the SelectedDate one, but does not throw an exception when given a null value. When embedding a RadDateTimePicker control inside a data-bound control, use data-binding expression to bind the value of the input control to the data source of the parent control. Data-binding expressions are contained within <%# and %> delimiters and use the Eval and Bind functions. The Eval function is used to define one-way (read-only) binding. The Bind function is used for two-way (updatable) binding. In addition to calling Eval and Bind methods to perform data binding in a data-binding expression, you can call any publicly scoped code within the <%# and %> delimiters to execute that code and return a value during page processing. The following example demonstrates how to bind a RadDateTimePicker control inside a RadGrid. <telerik:RadGrid RenderMode="Lightweight" ID="RadGrid1" runat="server" AutoGenerateColumns="False"
To see the live example that the example above was taken from, see Data Binding.